There are several food from Bangka which are very famous all over Indonesia. 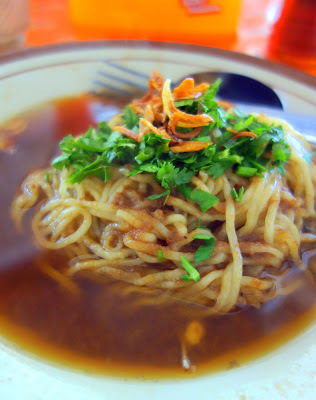 Two amongst the most famous are: Martabak Bangka and Mie Bangka (noodle). I didn't try Mie Bangka when I visited Pangkal Pinang, the capital city of Bangka-Belitung Province. 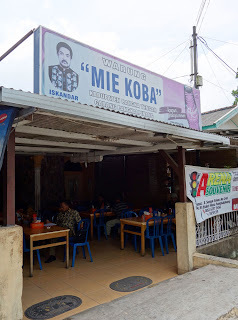 I was recommended to try Mie Koba, an alternative to eat halal noodle in Bangka. I went to Jalan Balai and just opposite Rumah Bersalin Rona, there's a small resto with a big sign of Mie Koba. 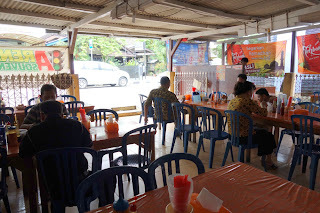 We ordered Mie Koba, I choose the one without boiled egg, as I knew that I was going to have another series of culinary experience in Pangkal Pinang that day. I love the taste! I like it better than Mie Atep I tried in Belitung. There's no aircon inside the resto, and yes it was hot inside. So better to visit Mie Koba in the morning for your breakfast, or in the evening for a light dinner. If you take morning flight from Jakarta, I would recommend you to visit Mie Koba before heading to Parai Beach. It will be a perfect meal to start your holiday in Pangkal Pinang. ini rasa kuahnya kaldu udang kaya mie atep juga ?